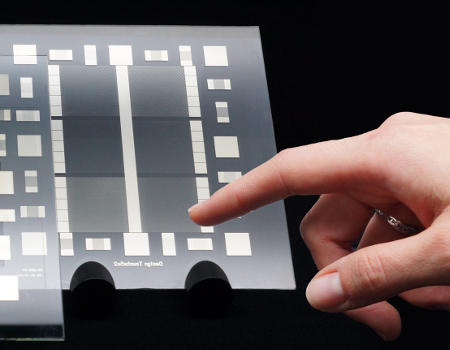 Photochemical metallization allows the manufacture of touchscreens in a single step. Research scientists at INM - Leibniz Institute for New Materials are presenting a new process that, in a single step, allows manufacture of conductive paths that are just a few micrometers in width on flexible foils. As a result, new designs for appliances with flexible or even rollable displays will be possible. In order for touchscreens on smartphones and tablets to function, microscopically fine conductor paths are required on their surfaces. When the users' fingers tap on or wipe over them, electrical circuits open and close, thus making the different functions of the smartphone possible. At the edges of the appliances, these microscopic circuit paths come together to form larger conductive paths. Until now, these different conductive paths had to be manufactured in several steps in time-consuming processes. The research scientists at INM – Leibniz-Institute for New Materials are now presenting a new process that, in a single step, allows manufacture of conductive paths that are just a few micrometers in width on carrier materials such as glass but also on flexible foils. On plastic foil, in particular, manufacture using the roll-to-roll process thus becomes particularly efficient. As a result, new designs for appliances with flexible or even rollable displays will be possible. For the new process, the developers use a process known as photochemical metallization: When a photoactive layer is irradiated by UV light, colorless silver compounds are transformed into electrically conductive metallic silver. Several methods can be applied to transfer the silver compound in paths or other structures on plastic foil or glass. In this way, paths of varying sizes down to the smallest size of a thousandth of a millimeter can be achieved. By irradiating these with UV light, corresponding conductive paths are created. “First, the foils are coated with a photoactive layer of metal oxide nanoparticles,” Peter William de Oliveira, Head of Optical Materials explained. “After that we apply the colorless, UV-stable silver compound.” By irradiation of this sequence of layers, the silver compound disintegrates on the photoactive layer and the silver ions are reduced to form metallic, electrically conductive silver. Oliviera added that this process offered several benefits: Since it is fast, flexible, variable in size, inexpensive and environmentally friendly, further process steps for post-treatment became unnecessary. This basic principle allows conductive paths to be created very individually. “There are three different possibilities we can use depending on the requirements: `Writing conductive paths` using UV lasers is the process which is particularly suitable for the initial customized prototype manufacture and testing the new design of the conductive path. However, for mass production, this method is too time-consuming,” the physicist de Oliveira explained. Photomasks that are only permeable for UV light at the desired positions can also be used for structuring. “For a `semi-continuous process` they are particularly suitable for applying the conductive paths on glass,” the materials expert says. The researchers are currently working intensely on a third method, the usage of transparent stamps. “These stamps push out the silver compound mechanically; conductive paths then only occur where there is still silver compound,” de Oliveira stated. Since the stamps are made of a soft plastic, they can be arranged on a roll. Because they are transparent, researchers at INM are now working on embedding the UV source directly in the roll. “Thus, the initial steps for a roll-to-roll process would already have been taken,” the Head of Optical Materials group concluded. It would therefore be possible to manufacture conductive path structures of various sizes on foils on a large scale.